NASA's presidential candidate Raila Odinga and President Uhuru Kenyatta 17 Nov 2017. 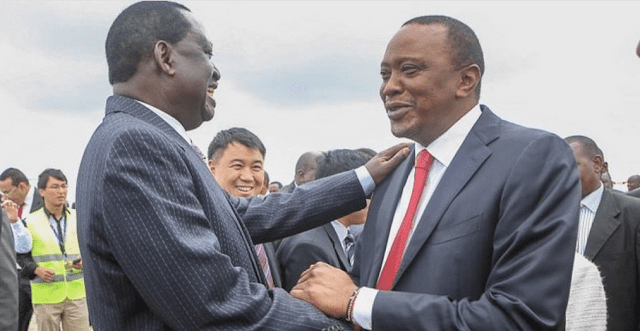 The United States is urging Kenyan opposition leader Raila Odinga to call off an “inauguration ceremony” next week meant to protest President Uhuru Kenyatta’s re-election. A U.S. Embassy statement calls the 12 December 2017's ceremony as “extra-constitutional” and urges the opposition to work within Kenya’s laws to pursue electoral and other reforms. The statement comes as the top U.S. official for African affairs, Donald Yamamoto, visits the East African economic hub after it faced months of political turmoil, including a repeat presidential election. He met with government and opposition leaders.The opposition calls its planned swearing-in of Odinga “lawful” and blames so-called “stolen” elections for polarizing the country. The U.S. statement also urges Kenya’s security forces to show “maximum restraint” after months of deadly clashes with opposition supporters.